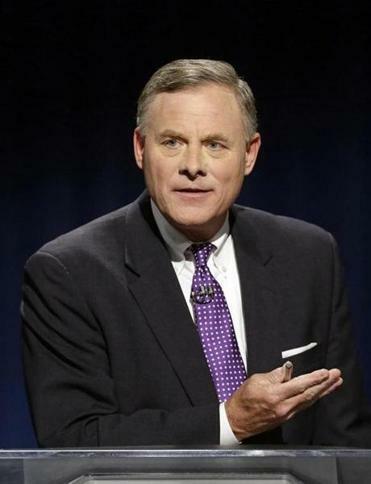 US Senator Richard Burr of North Carolina. Hey, did you hear the one about Richard Burr, the North Carolina Republican senator who “joked” last weekend that “nothing made me feel better” than seeing a picture of Democratic presidential nominee Hillary Clinton on the cover of a firearms magazine? “I was a little bit shocked at that — it didn’t have a bullseye on it,” Burr said, getting a big laugh from a roomful of GOP volunteers. 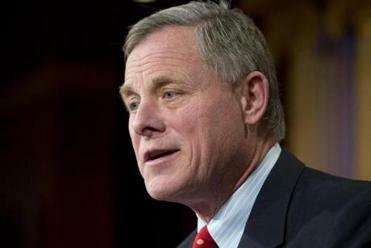 For what it’s worth — and during this campaign, so many apologies cover the ground like dead leaves — Burr eventually called his comment “inappropriate.” Of course Trump, the Republican presidential nominee, carped that he’d been misinterpreted. After all, why would anyone believe that a man who said of a protestor, “I’d like to punch him in the face,” and longed for the “old days” when such a person would’ve been “carried out on a stretcher,” would advocate violence? The North Carolina senator joked about how gun-rights supporters might want to put a ‘‘bullseye’’ on Hillary Clinton. In 1963, fliers accusing President John F. Kennedy of “betraying the Constitution” and declaring he was “Wanted for Treason” were distributed in Dallas days before his fateful trip. In times of uncontained political discontent, it is reckless to toss more fuel onto an inferno. After the JFK assassination, those raging fires would later consume Malcolm X, Dr. Martin Luther King Jr., and Robert F. Kennedy. With Election Day next week, millions are looking ahead with not just anxiety, but paralyzing dread. Some cities and towns are so concerned about possible violence that schools serving as polling places will be closed to students. By any standard, America is a breathtakingly violent nation. We’re not merely prone to it; we manically embrace it as an inalienable birthright. This season, that ferocity has been nurtured, cheered, and given malevolent purpose. Regardless of who wins, the uncivil war that has cleaved friendships, families, and this country will not heal after the votes are counted. Should something catastrophic occur, no one should pretend to be surprised. For more than a year, suggestions of political violence have been a crescendo careening toward what could be a bloody coda. We are a nation on the precipice of chaos when a presidential nominee and his supporters openly intimate that a bullet may be more effective, even preferable, to a ballot.